A few weeks ago here in Israel was Independence Day, and it's celebrated here much the same way it is the US... with barbecues! 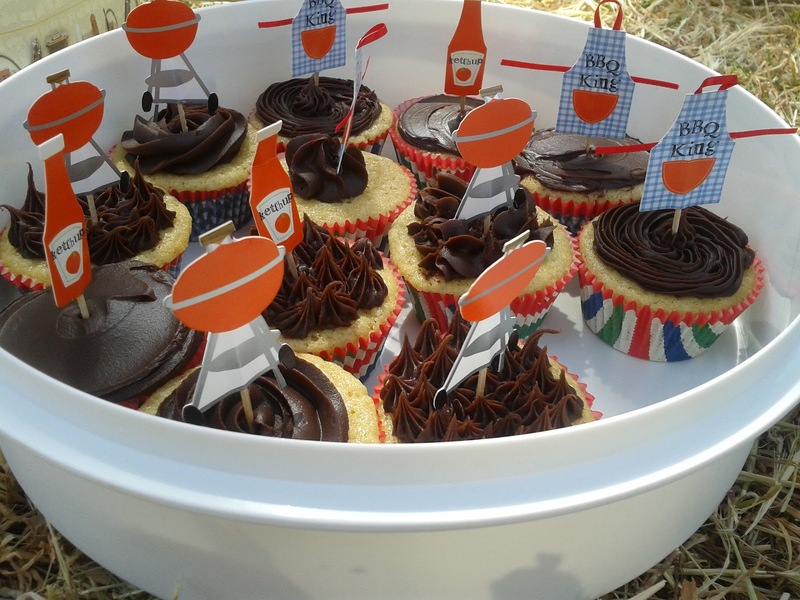 But of course after everyone has had their fill of hot dogs and hamburgers, they manage to make room for something sweet - and that's where these adorable cupcakes came in. These super cute cupcake liners and toppers were a gift from my dear friend Naomi before I left the US last year. I hadn't had a chance to use them, though I held on to them (and the rest of my cupcake liner collection) faithfully until opportunity knocked... and it did while sitting on the grass and eating hamburgers! They even have cute designs on the bottom - this one says "I love BBQ." Anyway, let's talk about the cake itself. Post-BBQ, when I took the remaining cupcakes to work, one of my coworkers proclaimed them "the best cupcake I've ever eaten." And well, he's not exactly wrong. I started with my classic yellow cupcake recipe and jazzed it up with some bursts of flavor that you would think would contradict - but don't. Then I topped it with my never-fail chocolate frosting and... genius was born. Just take the paper off before eating! Mix the lemon zest into the sugar, and let sit for 5 minutes. Beat the sugar together with the butter until light and fluffy. Add the eggs in, one at a time, mixing between each addition until completely incorporated. Mix in the vanilla. Add the milk and mix well, then gradually add in the the flour, baking powder, baking soda, salt and cinnamon. Divide the mixture between 24 paper-lined muffin cups. Bake on 350 F for 20-25 minutes, or until the cupcakes test done. Bring the cream, sugar and corn syrup to a boil over moderately low heat, whisking until sugar is dissolved. Remove the pan from the heat and add the chocolate, whisking until it is completely melted and incorporated. Cut the butter into small pieces and add to the frosting, continuing to whisk until totally incorporated. Transfer frosting to a bowl and cool, stirring occasionally, until spreadable. Don't refrigerate before using or it will become too hard to spread or pipe.